Union confirms NHS junior doctors to stage walkout across England between 12 and 16 September. Defiant Health Secretary Jeremy Hunt hit back at the British Medical Association (BMA) during a media round this morning (1 September). The top Conservative was on the offensive ahead of an unprecedented all-out strike from junior doctors across NHS England between 12 and 16 September. "We all want to make the NHS the safest and highest quality of care," Hunt told Sky News. "That means having to promise patients consistently high care across all seven days of the week and the way to solve the honest disagreement about how we get there is to sit around the table and talk – it is co-operation and dialogue and not confrontation and strikes which is going to cause absolute misery,"
The medics will strike between 08:00 to 17:00 BST over the five days as part of a long-running dispute between the government and the BMA over new junior doctors' contracts. The BMA wants to lift Hunt's imposition of the work agreements, while the health secretary has promised to press on with the reforms. The dispute has already seen six days of strikes in 2016, with the row calming down in May as the parties got around the negotiating table at mitigation service Acas. A new contract was then drawn up between the BMA and the government, with the union urging its members to accept the offer. But 58% of their junior doctors rejected the fresh agreement, triggering the resignation of BMA union official Johann Malawana and reigniting the dispute. The BMA is using its November strike ballot, in which 98% of medics backed walkouts, as its mandate for the latest action. "Junior doctors still have serious concerns with the contract, particularly that it will fuel the workforce crisis, and that it fails to treat all doctors fairly," said Ellen McCourt, BMA junior doctor committee chair. 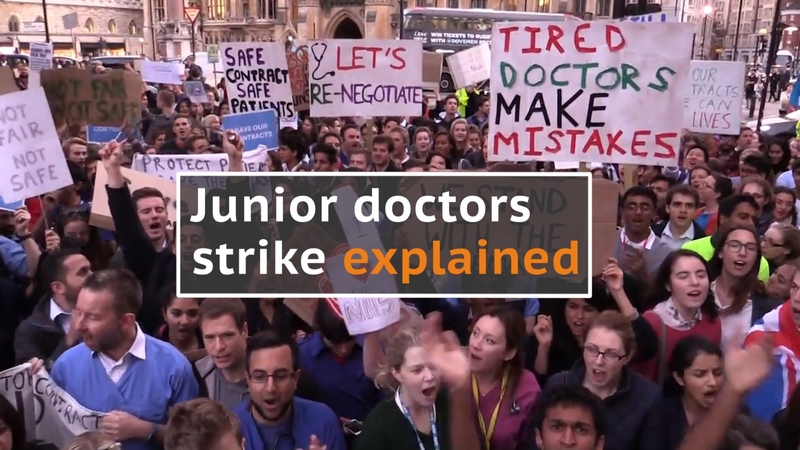 "Since July, the BMA has made repeated attempts to work with the Government to address the concerns that junior doctors have raised about the contract. "Genuine efforts to resolve the dispute through talks have been met with an unwillingness to engage and, at times, deafening silence from the health secretary, leaving junior doctors with no choice but to take further action. This is despite a pledge from Jeremy Hunt that his door is always open."